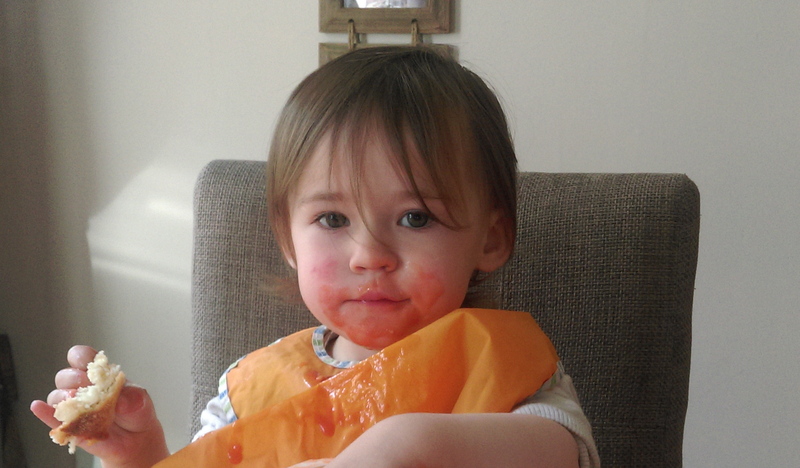 As regular readers of the blog will know,mealtimes are always a battle at our house. Mini is a fan of the beige food and unfortunately it looks like her sister is following suit. I continue to offer vegetables and meat at every meal (on separate plates mind to cause the least amount of potential meltdown) but still the war rages on. That’s why I was delighted to get the chance to try some of the new Pip & Pear baby food range that’s available in supermarkets nationwide. Each pot contains two portions of fruit and veg for you little ones. The company was started by Irene Queally, a busy mum of two who recognised a niche in the market for a baby food range that was just like home cooking. A successful restauranteur, Irene clearly knew a thing or two when it came to creating fresh, healthy meals for kids that were high in flavour, low in processed junk. 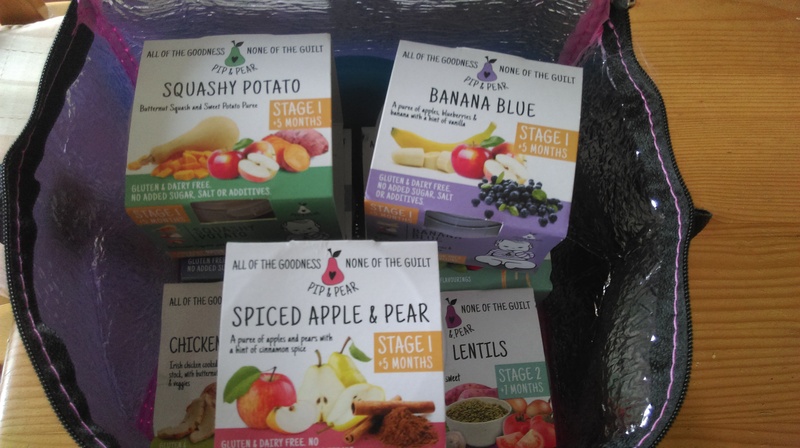 After fantastic feedback from parents and babies alike at a trial in Irene’s Waterford restaurant, the Pip and Pear range of delicious, nuticious, fresh baby food range was born. As well as containing no added salt or sugar, colourings, preservatives or flavours, the entire range of 9 meals is both gluten and egg free. The design on the packs are colourful and enticing and I couldn’t wait to see what the minis made of them. We started with the path to least resistance, the girls favourite and most important meal of the day,breakfast. We follow the French model of breakfast which includes quite choc heavy foodstuffs-Chocolate Weetos and the occasional hot chocolate drink. I also include some fruit-normally blueberries or raspberries but have been trying to introduce more healthy options such as porridge or eggs. So far no joy but the girls devoured the Banana Blue puree from Pip & Pear and even tried some porridge with it. Result!! It was flavoursome without being too cloyingly sweet, which is something I often find with other pre made fruit compotes. The other fruit option was the divine Spiced Apple and Pear. This is something that again worked magic on the previously ignored porridge and it would be lovely as a healthy dessert option too. As you can see they have something to cater for all tastes and each stage is carefully created to suit the growing needs of your baby. The girls were hesitant at first, but soon grew to love the little pots with their fresh ingredients. Mini often still eats more pureed food than what her peers would be consuming. She was very late to get teeth-the first one only emerged at 17 months and so food has always been a challenge for her. It was great to see her and her sis chow down on some really healthy ingredients such as fish and lentils, and of course mopping them up with some crusty roll. Hey, they are half French after all! It made me feel a lot more confident in offering more varied options to her at the dinner table, which is a bonus I wasn’t expecting with this review! Another thing I loved about the range is that all their packaging is 100% recyclable. This is great as one thing I’ve noticed is that not all baby food comes in easy to recycle containers. The pots can easily be reused and filled with hearty goodness made from the easy to follow recipes on the Pip and Pear website. Follow Pip and Pear on Facebook and Twitter for more healthy inspirations! Disclaimer:I received a hamper of meals from the Pip & Pear range for the purpose of this review. No payment was received and all opinions remain my own honest ones. Huge fans of Pip & Pear here! The apple dessert is amazing. I’m always sneaking it with a bit of granola and berries! Great review; these sound handy for days when I am not being supermam! Which happens quiet alot tbh. Thanks,they’re so handy! !Supermam who’s she? ?